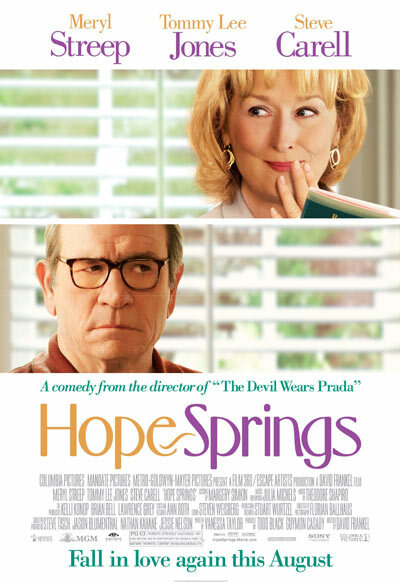 REVIEW: In what has seemed thus far an August devoid of good movies at the box office, "Hope Springs" does what its title suggests. There is hope for quality, big studio movies at theaters. These lyrics by Sam & Ruby waft in the background during the opening scenes of “Hope Springs,” out in theaters nationwide Aug. 8, and perfectly sum up the present situation of Kay and Arnold. The couple, married 31 years, seem to have lost the magic in their relationship. They go about their days following the same old routine and sleep in separate rooms. Kay (Meryl Streep), in an attempt to add a spark to her marriage with Arnold (Tommy Lee Jones), suggests intensive couples counseling with a doctor in Great Hope Springs, Maine, that she’s been reading up on. It’s more like an ultimatum: Go with me or else. The catch is Dr. Feld (Steve Carell) is far away and expensive. Like all husbands who know better, Arnold begrudgingly agrees to go. The therapy sessions with Feld and the couple are, at times, hilarious. The comic timing and dialogue are perfect. The movie feels almost like a play, focusing on the script and characters instead of action or scenery. Arnold is initially not happy to be “trapped here like Alcatraz” with no way out, he complains to Kay. The weeklong vacation in Maine features many ups and downs. 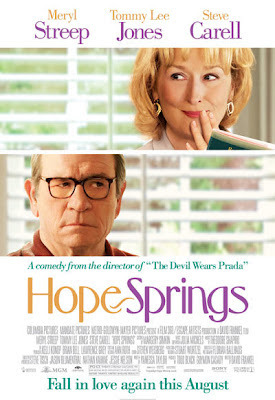 In what has seemed thus far an August devoid of good movies at the box office, “Hope Springs” does what its title suggests. There is hope for quality, big studio movies at theaters. Granted, the demographic skews a bit older for this movie, but anyone who has been in a relationship will enjoy it. Watching the intimate moments between Streep and Jones is touching, not awkward. The chemistry exhibited on screen between them is remarkable. What could have been an unexciting movie is transformed into something else thanks to that chemistry. Jones gives audiences a performance they haven’t seen before: he’s vulnerable and great at it. Carell also adds to the mix and is surprisingly good at playing doctor. Audiences will laugh and cry. Rated PG-13 for mature thematic content involving sexuality. Though it tried too hard to go for the rom-com conventions, it’s still succeeds as a study of where relationships can go, and how dull they can sometimes get. Streep and Jones are perfectly cast and keep this film moving like it deserves to. Good review James. Thanks, Dan. I agree about the conventions. The play-like atmosphere created was very enjoyable. It probably should have been marketed better though. Keep up the great reviews yourself.